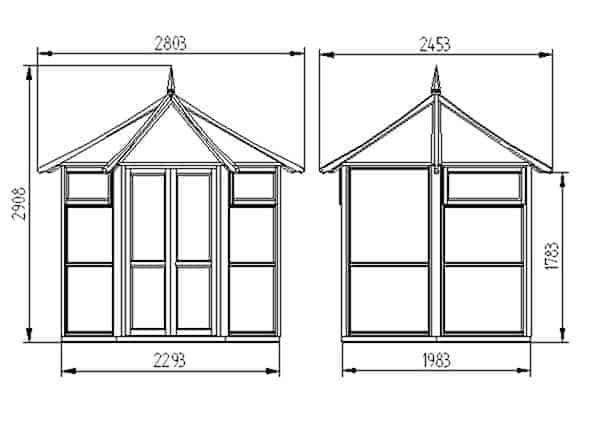 The Hartwood 9′ x 8′ FSC Malvern Glass House is one of the most unique looking structures you can get. 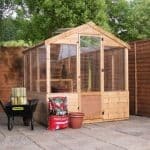 No matter if you decide to use this as a place to grow plants and vegetables, or even if you think it would be really great to use as a summerhouse, this is one incredible structure that you are going to be able to have a lot of fun with. Clearly this is one very attractive glass house with its hexagonal shape and that lovely looking roof with the high peak which by the way ensures that you have a vast amount of headroom. The space inside is very generous and you will have a lot of room to make use of. You are going to love the large double doors as they make getting items and yourself in and out very easy. The glass house comes with five sets of staging so you will have plenty of places to place things and keep them off the floor. At a glance it may look like this is a rather simple kind of structure and it actually is, but the materials they have used are top of the line. 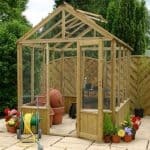 Most of the structure is made with high quality safety glass and is then supported with a robust frame that ensures the whole structure has a strong and sturdy feel. The flooring is made with high quality tongue and groove boarding which looks very smart and is also able to take a lot of weight. Now here is something with a very unique look. 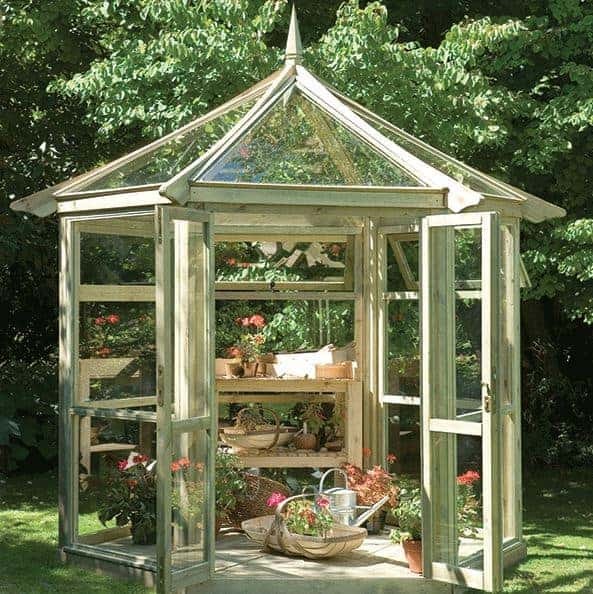 The Hartwood 9′ x 8′ FSC Malvern Glass House is part summerhouse and part greenhouse and it really could not look any better. They have just done an amazing job with this and it certainly is something that is very pleasing to the eye. 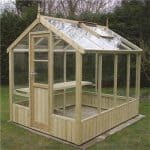 No matter if you do decide to use this as a summerhouse or someplace to grow and care for plants and vegetables, we are sure you are going to be very happy with it and it is sure to get you a lot of compliments and questions from folks when they come round to visit. At 9 feet 2 inches wide and 8 feet 1 inch deep it is a very good size, but not overly large. We really like the hexagonal design of this as it gives you many possibilities when it comes to laying things out. It is one of the higher garden structures we have seen as at the very top it stands at over 9 feet tall and even at its lowest point it is an impressive 6 feet high. One really awesome bonus with this is that it comes with five sets of staging for you so you will have a few places to store things once you have installed it. The roof is made with strong safety glass and it looks incredible. Each section of the roof is its own triangle that is kept secure with a high quality timber framing. We are sure that standing in here and being able to look up at the sky is going to be a really cool experience and if you had a light in here so you could spend time inside here at night, being able to look up at the stars is something that would be a lot of fun. There is no cladding in a traditional sense with this glass house as all of the walls are made from high quality safety glass. We love the look as it is just so unlike any other kind of summerhouse and like we said before it would make this something that would work very well as a greenhouse. Each section of the greenhouse does not just have one large glass panel. Instead to give it a bit of style it is broken up with some framing which gives it a very nice effect. You may think that a structure that is predominantly made from glass would be a little on the weak side. Well that is not the case at all as this is supported with a very impressive 45 mm x 45 mm framing that you can clearly see. We love how as it is mainly made from glass, the frame becomes a major presentational feature as well as being the thing that is going to keep the glass house strong for many years. To go with the rest of the glass house they have used a glass flooring that you need special shoes to walk on. Only joking of course, but we bet we had a few of you going. We love the flooring that they have used inside here. They have gone for this lovely looking, but also very strong tongue and groove flooring. This can take a lot of weight so you could have lots of items inside of here and the floor will easily be able to take it. You may want to give the framing a little coating of wood treatment once a year in order to help it fight off rot, but the actual glass is very low maintenance. A blast with the garden hose or if you like to be a bit more thorough, a wipe down with the bucket and sponge is all that is needed to keep it clean. 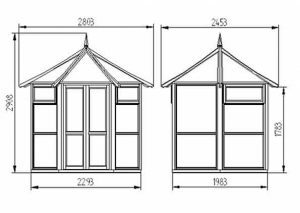 The Hartwood 9′ x 8′ FSC Malvern Glass House comes with a 15 year guarantee which the only condition of it is that you maintain the glass house properly. Located on the front of the glass house is a set of large double doors. These are rather high and wide double doors though, as they are 5 feet 9 inches high and 3 feet 1 inch wide so they are large enough to make getting things in and out easy. Each door is made with the same kind of high quality timber frame and safety glass as the rest of the glass house. The whole structure is mainly made up from the same kind of strong safety glass that has been chosen because of how strong it is. The glass house can be locked up safely at night as there is a lock and key included with it. We are happy with this as it does mean that you can keep your belongings safely locked away. Of course as it is mainly made from glass that does mean you do not get the same kind of security that you would a summerhouse that is made from timber. Privacy is really not an option with this as it is made mainly from glass. There is not any place you can hide things in here unless you have some kind of storage box. Unlike a wooden summerhouse that you can coat with paint there is not really anything at all you can do in order to change the looks of this glass house and to be honest with you this is something that we are fine with as it has such a unique and cool look as it is, we think it would be a real shame to change its looks even if you could. No extras are on offer here so there is nothing else you need to worry about purchasing. This is a very impressive glass house that may look simple, but it is very high quality and we are very impressed with how strong and long lasting it is. In general the materials used are very strong and they also require very little maintenance. Of course glass is not as strong as timber so you will want to stop the kids playing football next to it, but we are actually very impressed with this and are sure it is going to last many years. 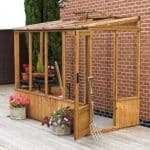 We have seen larger greenhouses and summerhouse, but this is still a very good size. You have plenty of room inside here and the headroom that it offers is incredibly impressive. This is something that will require two people to install. Also be sure to follow the instructions and take your time. We feel that 6-8 hours is a good time for installing something like this. The cost of this is very high, actually it is one of the highest cost structures that we have seen in quite some time, but as it is made with mainly high quality and high cost, safety glass the price they are asking really is not all that surprising. Final Thoughts: We love the design of the Hartwood 9' x 8' FSC Malvern Glass House and it is very clever how they were able to make it mainly from safety glass, but still ensure that it is very strong. The decision to use a 45 mm x 45 mm frame was a very smart one and that along with the glass does make it a far stronger structure than you would think. Of course the main stumbling block this is going to have for many of you is the price tag. This is a very expensive structure, but it is also one of the most unique and interesting ones we have ever seen. So while clearly this is not something that would appeal to everyone for those of you who want something a little different then this is worth considering, if you can look past the price tag of course.